The recent reports of supposed High Tech Birds spying for Pakistan, which have subsequently been claimed to be sporting birds, has prompted me to send you a photograph of a real German Hero. 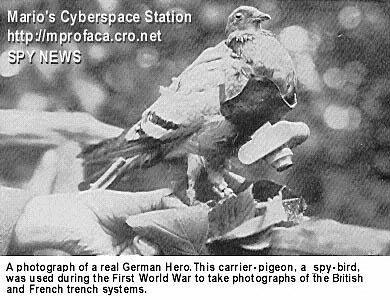 The bird was used during the First World War to take photographs of the British and French trench systems. How the bird was tasked, tracked and recovered is not mentioned in the documents I have. Nor is there any mention of how the photographs were related to ground and evaluated. Still it shows the inventiveness of the mind that such an idea was deemed worthwhile. I have no objections to you putting the original on Spynews complete with my address. The photograph is First World War. It came from a book called Die Weltkriges-Spionage published in 1931 by Verlag Justin Moser in Munich. The book has 71 chapters, each written by a former German Intelligence Officer, and was compiled by the publisher in their words as 'An authentic account of the methods, work, technology, handling, results and secreacy of Spying'. Sadly it is in German and printed in Old German Gothic Script. The book is the best I have found on the subject of spying. I doubt many were published and very few will have survived. An analysis of the spying operations of friends and foes. Post War Spying in Germany - all by the French!
' Pigeon with Photgraphic Apparatus'. I woul describe that as a very germanic description. The book has been owned by my family since 1931. 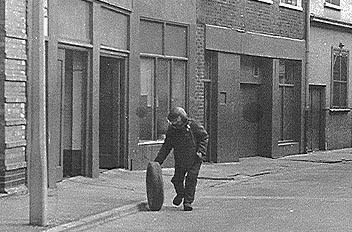 Nigel Wylde had to remove this tyre from the top of a fire bomb which he then defused. A brief r�sum�: 18 months ago, Mr Geraghty, who has written several books on military matters, published another entitled The Irish War. It contained a section on how the British Army carries out surveillance of IRA suspects, including some details about computer programs. It went on sale, was praised in a number of reviews and did well enough in the bookshops to encourage the publisher, Harper Collins, to announce a paperback edition. At that stage the D Notice Committee, a shadowy institution which most of us thought had long since disappeared, wrote asking for the book to be submitted for official scrutiny. Mr Geraghty refused. In his experience, and it is considerable, handing over material to the MoD or intelligence agencies may place at risk the identities of informants who have been promised anonymity. He was certain there was nothing in the book which threatened security or put lives at risk; as a historian of the SAS, and a squadron leader in the RAF military reserve, who served with General Sir Peter de la Billiere's staff in the Gulf War, he is hardly a novice in these matters, nor is his patriotism in doubt. Shortly afterwards, however, he was arrested at his home on the Welsh borders by MoD police. They appeared to be operating without the co-operation of the local force, since Mr Geraghty had to tell them the way to his nearest police station. There he was charged under Section Five of the Secrets Act. At the same time, 150 miles away in Esher, Nigel Wylde, a former lieutenant- colonel in Army Intelligence, alleged to be Mr Geraghty's informant, was also arrested and charged under the tougher Section Two of the Act, which covers Crown servants disclosing information judged to be damaging to the national interest. Significantly, there is no public interest defence, and in Section Two the onus is on the accused to prove that he did not know national security might be damaged, rather than the other way around. That is, Mr Wylde is guilty until proved innocent. Both offences carry prison terms. Journalists in the dock, information suppressed, telephones tapped: to Duncan Campbell, it sounds all too familiar. A few days ago, on 22 June, I watched Tony Blair on the evening news from Birmingham. He was reassuring us that Labour had not forgotten its traditional values, that the Party of the Millennium still bears a resemblance to its predecessors of the sixties and seventies. Tony is right: absolutely, completely right; of course he is. It was just like this under Jim Callaghan, David Owen and Merlyn Rees. And if I ever doubted it, the events of that same day, Tuesday 22 June, convinced me. That morning, at Bow Street Magistrates Court, in London, Tony Geraghty, a former Sunday Times reporter, was indicted along with Lieutenant-Colonel Nigel Wylde, a retired army officer, under the Official Secrets Act. The Attorney-General had consented to the prosecution, the court was told. The kernel of the alleged offence was that Geraghty's book, The Irish War, published in 1998, revealed details of official computer surveillance systems used mainly in Northern Ireland. They are code-named Vengeful (vehicle surveillance) and Crucible (personal information). Yet the book is still on sale, and the offending portions can be read around the world on the Internet (http://jya.com/irish-war.htm). Further, most of the information has been publicly known for years. As long ago as 1974, Merlyn Rees, then Northern Ireland secretary, revealed the existence of Vengeful. I wrote a book, published in 1986, which contained far more information on the matter than Geraghty's. So why is the government bothering? I'm not surprised by the case. I was the last journalist before Geraghty and Wylde to be prosecuted under the Official Secrets Act. In the past 40 years only Labour governments have prosecuted journalists. Tony Geraghty: "The Irish War"
"Since The Irish War does contain material that is damaging to national security, we would urge you not to disseminate this material further..."